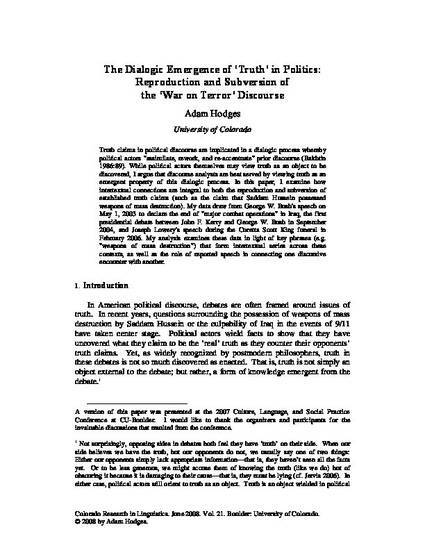 Truth claims in political discourse are implicated in a dialogic process whereby political actors "assimilate, rework, and re-accentuate" prior discourse (Bakhtin 1986:89). While political actors themselves may view truth as an object to be discovered, I argue that discourse analysts are best served by viewing truth as an emergent property of this dialogic process. In this paper, I examine how intertextual connections are integral to both the reproduction and subversion of established truth claims (such as the claim that Saddam Hussein possessed weapons of mass destruction). My data draw from George W. Bush's speech on May 1, 2003 to declare the end of "major combat operations" in Iraq, the first presidential debate between John F. Kerry and George W. Bush in September 2004, and Joseph Lowery's speech during the Coretta Scott King funeral in February 2006. My analysis examines these data in light of key phrases (e.g. "weapons of mass destruction") that form intertextual series across these contexts, as well as the role of reported speech in connecting one discursive encounter with another.